Made these tonight and they were very good. Easy! Looking to use big portobello mushrooms. Any info how I can adjust the ingredients and still remain relatively healthy? Question………can frozen spinach be used? And, if you make the stuffing ahead, how far ahead can it be made?? Love your website!! Made these this weekend, They are delicious. I made these last night and they were wonderful. I'm not going to lie, it's a lot of work. I think I might cheat next time and use some of that pre-packaged bacon crumbles from the salad aisle. I am wondering if I can make the filling; stuff the mushrooms, but freeze them. Then bake once I'm ready to serve them… ? Cyndi, Did you try this? I want to do the same and I'm wondering how it turned out. My mom is from India and makes the most scrumptious and addictive stuffed mushrooms. Spinach, cilantro, green onions, jalapenos, garlic, parmesan. Everything in the food processor – stuff, bake, serve. Basically it's chutney in a mushroom. Delish! I made these today for our Super Bowl party and everyone LOVED them! I doubled the recipe, but forgot to double the amount of spinach I bought, so that stayed the same. There was more than enough filling for the 29 mushrooms that were in the two packages I bought. I sprinkled a pinch of shredded parmesan on top of each one just to make it a little "pretty." I was able to make them in the morning and keep them in the fridge until it was time to bake. They were fantastic and I'll definitely make them again! I made these not to long ago and they were WONDERFUL! I can't wait to make it again. I made these for a holiday party I hosted for my co-workers and they were all disappointed that I didn't have more! I guess next time I'll have to double the recipe. They were delicious! Can you freeze these stuffed or cooked then warmed? I made this recipe yesterday for a family dinner celebrating my brother's birthday. I substituted chopped pecans for the bacon. It worked out really well. I also added one teaspoon of basil and one teaspoon of lemon dill seasoning. They were fantastic!!! We made these for Super Bowl and absolutely loved them. I had extra filling so I decided to make stuffed chicken breasts. I put the extra filling inside each slit breast and the remaining over the tops. I covered them in 1/4 inch of cooking wine, cooked at 400 for 20-30 minutes, and served over couscous. My husband was IN LOVE and ate every last crumb!! We're definitely keeping this recipe! I made these last night–another winner! Had to use frozen spinach, added half a shallot to the garlic, and to make the stuffing stick together more, I tossed in the leftover cream cheese/jalepeno/bacon stuffing I had from making your jalapeno popper chicken the other night. I will add these to the Superbowl menu, thanks again! Superb! I had only turkey bacon in the house, and they were delish. 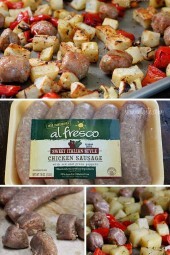 We are planning a dinner of these one day soon – soooo good! I know you said you could make the stuffing ahead and stuff before cooking them. I'm short on time this week and want to make these for Saturday. Do you think on Thursday I could make the stuffing and let it cool, then assemble them cold on that night (keeping them in the fridge in the meantime) and just cook and serve them on Saturday? I really want to make these! Made these tonight and they were great. I had 2 oz of fat free cream cheese I needed to use up so I added that to the mix and they were creamy and delicious. 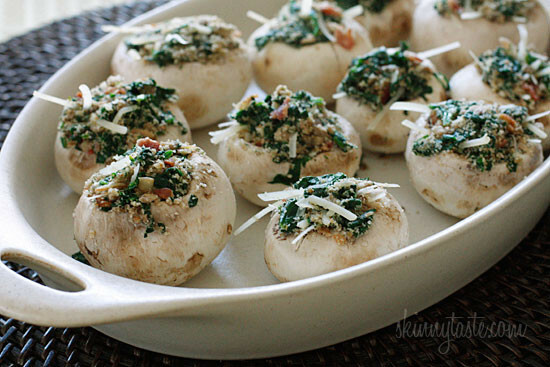 Made these as an appetizer on Thanksgiving, and EVERYONE loved them… including my hubby who doesn't like mushrooms OR spinach! 🙂 Thanks for another delicious recipe. I made these for Thanksgiving & they were a total hit! Delicious! Thanks Gina. I made these with Baby Bella mushrooms and they were a total hit! everyone loved them! Thanks Gina!! hi there! could i use shitake mushrooms? I made the stuffing, adding the (chopped) mushroom caps and omitting the bacon, and made baked stuffed swai fillets. YUM! Cooking now, about to make my usual stuffed mushrooms for my family that are stuffed with a cube of fresh mozzarella and then topped with the seasoned breadcrumbs that are mixed with olive oil. Then decided to check your site….and voila! I am now making these for me! 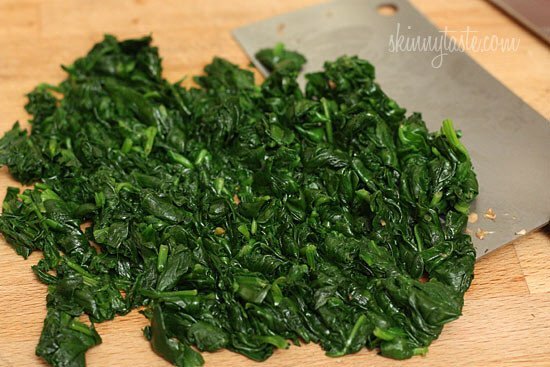 I have a bunch of frozen spinach.. would this recipe work with thawed, squeezed frozen spinach? OMG…I made these last night. I used portabello mushrooms. DELICOUS!!! Made these tonight with cremini mushrooms. I substituted soy bacon and it was excellent. I made it with roasted acorn squash (substituted Agave for brown sugar in that dish) and vegetable stuffed talapia with dill butter. Great dinner, real healthy and low in PointsPlus value for those of us on Weight Watchers. I make something really similar to this that I truly think you would love. It gives it a Mediterranean twist. I added extra garlic and a tad bit of chopped jalapeno! I can't wait to eat them! Thanks for this recipe; I also have never made stuffed mushrooms before. I added low-fat semi-sundried tomatoes and they are DA BOMB! AND your website is amazing ! I made these using canned chopped clams instead of bacon , upped the garlic and added some sofrito. They were ridiculously good. 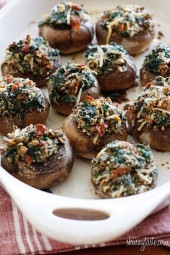 I never made stuffed mushrooms before-thank you for making this so easy !! I have made these several times and they are amazing!!! I use the Hormel Real Bacon Bits that come in bag (cuz' it's all I had in the house). 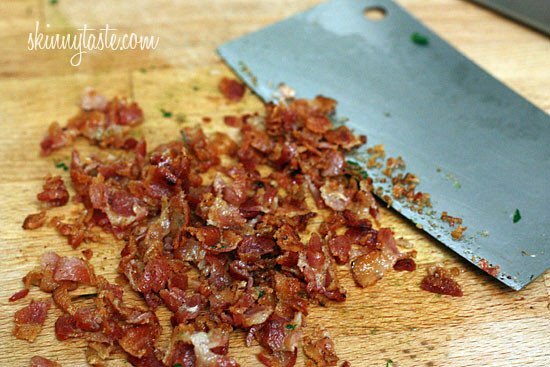 2 Tablespoons are only 1 point so I use them in a lot of recipes that use bacon. I could seriously make a MEAL out of these wonderful mushrooms! I make them at least once a week now. Thanks for sharing this one! I made these tonight with turkey bacon. They were super filling and delicious! I have made these several times so far and each time they have disappered. 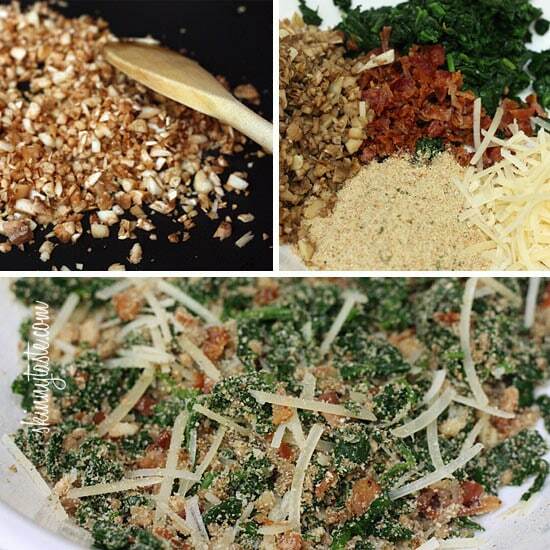 I add extra garlic and served them also as a side dish with my italian dishes. These mushrooms are tate soooo gooood!!!! I made these today and all I can say is THANK YOU for the recipe!!! they were awesome!!! I made these for the Superbowl and I could have eaten the whole plate!! I forgot how good stuffed mushrooms were! Made these yesterday and they were pretty good. Made mine with turky bacon. I think pork bacon would have been way better, but they were still good! Wow!! These were incredible!! My entire family absolutely loved them. Needless to say, there were NO leftovers!! Thank you so much for what you do Gina. My husband is on Weight Watchers and is already down 19 pounds. You make it sooooo easy. Thank you. What a recipe! I am loving all the flavors in this. Yum! Fantastic! I could have eaten them all! I loved the filling! I left out the bacon (I have a son who is vegetarian) and added just a little bit of feta like you suggested. I am thinking of making the filling and using it to do a stuffed chicken breast. Made with turkey bacon. Absolutely delicious! I made these tonight as a healthy alternative for the Super Bowl. They were fantastic. 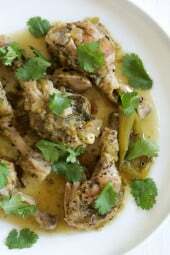 I look at you website all the time but this is the first recipe i have made. It was great! Thanks! Made 'em…love 'em…taking a big batch to the Super Bowl party in 15 minutes! Love your blog! These are delicious!!! I have made these twice in one week. They have been a hit both times. I made them with feta cheese instead of bacon. Definitely a keeper! Made these today as an appetizer before the Super Bowl…all I can say is WOW!!! These were fantastic!! These sound great….so glad and excited that a friend recently told me about your website! You have put so much time and effort into your recipes….so thank you, thank you, thank you!! 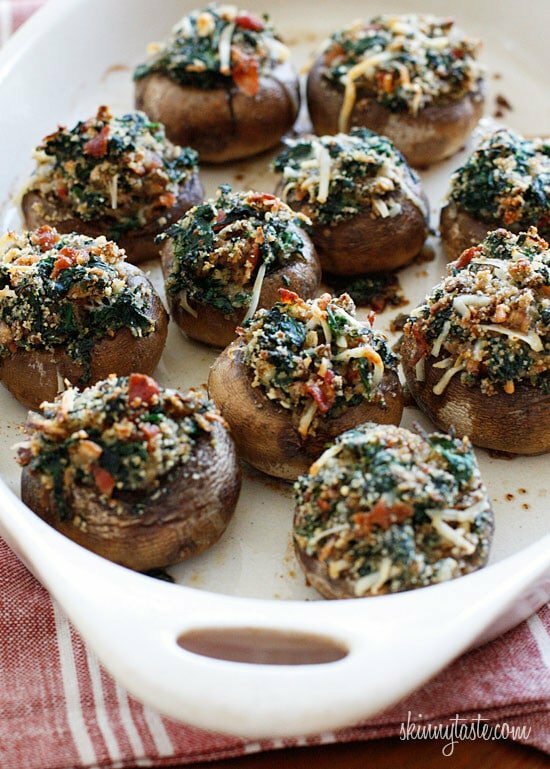 Thanks for this recipe for skinny spinach and bacon stuffed mushrooms. They pictures are great. Sounds YUMMY!! I LOVE anything with mushrooms and/or cheese!!! Preferably BOTH! If I take the bacon out of it, will it still be one point? What about a bacon substitution. This would be great filling for either red bell peppers or tomatoes stuffed with it! Thanks! Mmmmm. Going to make these for Superbowl Sunday this weekend. Thanks for the recipe. Omg..they sound amazing! Thank you! Kristen, I should be a spokesperson for Tuttoroso because I really think using their tomatoes make a difference. They often go on sale and I purchase a bunch to stock up. Colleen, not sure if the spinach would be to watery for the wonton? Wow these look so good! I loveeeeee stuffed mushrooms and I usually make them the traditional way, with just garlic, chopped stems, breadcrumbs and olive oil…so if your reduced cal ones are 34 calories each..i can only imagine what the regular ones are..but the problem is that I'll eat about 6 of them..oh no! i better just stick to your recipe from now on! thanks so much Gina! These look so good! I may add some garlic, I'm Italian it's a staple :O) Do you think this filling would work folded and baked in a wonton & served w/ marinara? These look so good! Definitely making these on for the Superbowl! On a side note, I make a lot of your recipes but I am in college and on a super tight budget so I often substitute ingredients for cheaper alternatives. When you post a recipe that uses canned tomatoes, I always buy the store brand because they are much cheaper. My local Food Lion is going out of business and everything in the store is 50% off so I snagged up a few items that I normally don't buy including the tuttorosso tomatoes that you always recommend. I used my first can a few days ago in a creamy tomato soup and wow…it totally made a difference in the taste of the soup. I'm carefully deciding what recipe to use my other can on…there are so many good ones! You have definitely converted me on the tuttorosso! Melanie, would be awesome in a potato skin! Cincy, yes I season the mushrooms with salt, then spray them after they are stuffed. Stupid question here but are you salting & spraying the outside or inside of the mushroom caps? My goodness this is going to my new favourite disk. It combines every food I absolutely LOVE! Gina you are seriously the best! These look so good! I don't like mushrooms, so I am going to find a different vessel for the filling. Maybe a baked potato?? Just made these…they are soooo wonderful! I used real bacon bits because I didn't have bacon but it still tasted wonderful! You could probably leave the crumbs out of gluten free. Kay, these are a package of larger mushrooms they sell for stuffing. 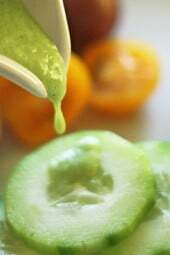 I haven't tried them with zucchini, I would grate it, and saute it with garlic first so it's not too watery. This is fantastic!! I was looking for a healthier stuffed mushroom recipe for Super Bowl Sunday and here you anticipated my needs. Fabulous. Just fabulous. Wow, these look great! Always looking for more ways to eat spinach. That's an awful lot of stems from just 11 mushrooms! Do you think grated Zucchini would be an acceptable sub for the spinach or would it be too bland? I am thinking it would be very bland and smushy! maybe sub grated parm for the breadcrumbs? 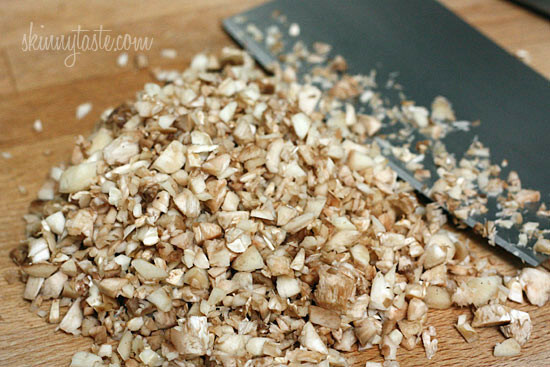 I always used ground up Rice Chex to make things that call for breadcrumbs GF. Oh yummmmmmm I AM ADDICTED to your website. I am definitely making these tonight. Thanks for helping to make my Weight Watchers journey successful!!!! I use Udi's gluten free bread chopped finely for any recipe asking for bread crumbs, works great! and add italian spices to make it just right!! I use an egg or egg white and leave out the breadcrumbs. Tastes amazing! Also nice to throw in a pinch of crushed red pepper flakes for a kick! oh…my…word…will make these today. they look scrumptious! thanks! Any ideas for making these gluten free? They look fab!! Skip the bread crumbs and just add some Italian spices. I'm going to use rice crackers, rice crackers, or gluten-free crackers of another type. I might add nuts too. I used some left over quinoa and fresh Italian herbs – not because I have a gluten intolerance – but because I had left over quinoa 🙂 Was YUM !